HÀ NỘI – The V.League 1 is set for a photo finish again this season, with three teams in with a chance of taking home the title after the final round of fixtures today. Defending champions Hà Nội, FLC Thanh Hoá and Quảng Nam each have 45 points after 25 fixtures, and with each team in action today, football fans are set for a thrilling day. The capital side have the simplest route to glory, as a win away to Quảng Ninh Coal in Cẩm Phả Stadium will secure the title as they hold the head to head and goal difference tiebreakers over Thanh Hoá and Quảng Nam. Quảng Ninh are three points behind the title contenders, but a first league title in their 61-year history is impossible due to an inferior head to head records against Quảng Nam and a poorer goal difference than Thanh Hoá. 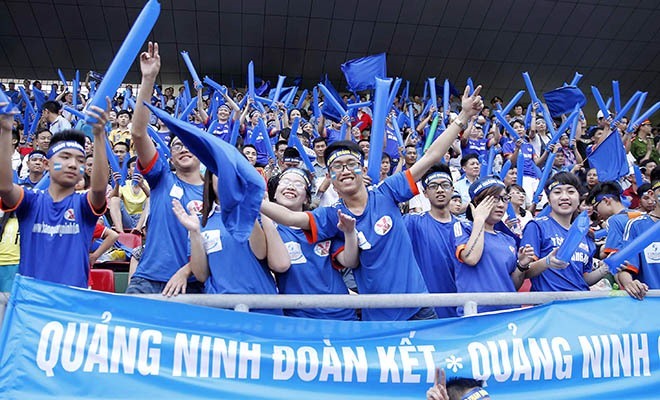 Despite having little to play for, Quảng Ninh will be difficult for Hà Nội to overcome, with their raucous support sure to create a cauldron of an atmosphere. “My team will play hard with the defending champions to try and make a surprise in the title race,” said coach Phan Thanh Hùng of Quảng Ninh. Hà Nội will have to do without key defender Trần Văn Kiên due to suspension, while the home side will also be missing midfielder Trần Trung Hiếu and defender Nguyễn Xuân for the same reason. With the game critically important, the league’s organisers decided to hire referee Nathan Chan Rong De of Singapore to officiate the match. The 26-year-old is a FIFA-level referee. In the other title-deciding fixtures, Quảng Nam are at home to HCM City while Thanh Hoá travels to Sông Lam Nghệ An. Thanh Hoá are the least likely to take the title, as they require victory over Sông Lam Nghệ An and draws or losses for Hà Nội and Quảng Nam. Quảng Nam will be without key players Junior Claudecir and Phan Thanh Hưng at Tam Kỳ Stadium because of suspension and injury, respectively. Brazilian Claudecir has scored 12 goals for Quảng Nam in the league this year, making his loss a huge blow. For Quảng Nam to take the title, they must beat HCM City and hope Hà Nội fail to win against Quảng Ninh. “Quảng Nam’s task is to beat HCM City and then see the result at Cẩm Phả Stadium. We will play with all our hearts. The game at Cẩm Phả Stadium won’t affect our match,” said midfielder and captain Đinh Thanh Trung.